Popular also as Phanaeng, Panang Curry is a Thai red curry that is easy to make and tastes as authentic as the one made in thai restaurant. It is smothered with the earthy flavours of Thailand, Malaysia and Burma. So, vouch by my words for it to be lip-smacking! Here is how to make Chicken Panang Curry Recipe. Popular also as Phanaeng, Panang Curry is a Thai red curry that is easy to make and tastes as authentic as the one made in thai restaurant. It is smothered with the earthy flavours of India, Malaysia and Burma. So, vouch by my words for it to be as lip-smacking as Thai Green Curry with Eggplant, Snowpeas and Tofu, Thai Pumpkin Noodle Soup, Thai Red Curry with Tofu and Vegetables. Traditionally, it is a popular Thai accompaniment that is eaten with rice and you can make umpteen variations of this curry. To make a non-vegetarian version of this curry recipe, you may use chicken, beef, meat, shrimp et al. Furthermore, you may prepare a vegan version of this dish by using tofu and make it keto, whole 30 and salubrious. Additionally, you could even substitute vegetables instead of meat. It would go well as well. What is Penang Curry Paste made of? How to make Panang Curry Paste at home from Scratch? If you have peanut allergy, you can skip using them. If you want a Vegan Penang Curry Paste, skip using shrimp paste and use 1 tbsp soy sauce instead. Can you freeze Panang Curry? Since Panang Curry contains coconut milk, it might get spoiled while re heating. The milk can split when re heated. Although the curry will not spoil, but the taste may alter, so I don’t recommend freezing the curry. What to serve with Panang Curry? This curry goes best with jasmine rice. You can serve it with any variety of rice if jasmine rice is not available. Panang Curry is named after the city island called ‘Penang’ of Malaysia. Compared to Thai Red Curry, this curry is sweeter, creamy and luscious. How to make Thai Panang Curry? First of all, you need penang curry paste | panning curry paste. It is easily available in market just as red curry paste. Furthermore, this curry gets its varied taste from fish sauce, brown sugar | palm sugar, kaffir lime leaves, coconut milk, thai basil leaves which are cooked with chicken pieces on a medium heat. I have also added red bell peppers and yellow ones to give a nice colour to this Asian Market special curry. You can add any meat or vegetables of your choice to this curry. Bring the curry to a boil and let the it simmer very well. Finally, garnish it with fresh basil, red chillies and serve piping hot with rice. 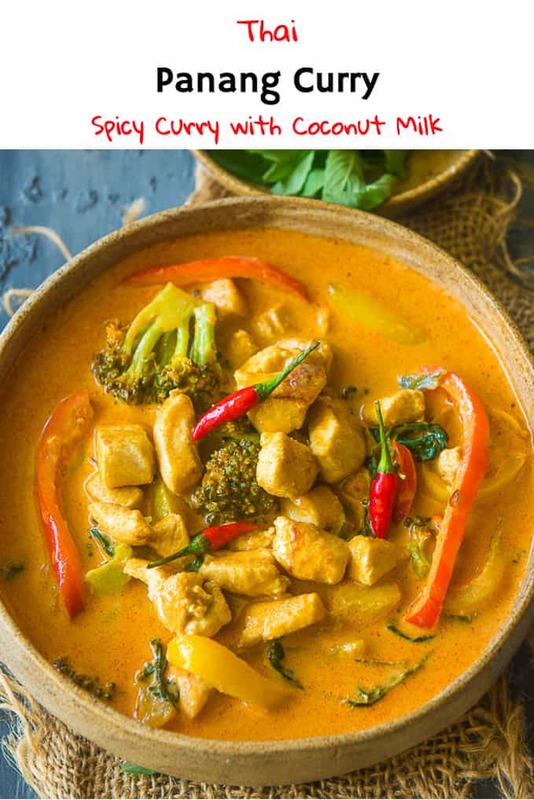 Conclusively, this delish curry should be made because it is different from the usual Thai dishes and variety is the spice when it comes to food and happiness, right? Let’s get going and note down the recipe then? What say, people? Instead of chicken, you can also use beef, shrimp and fish in this curry. You can make a vegan version by adding tofu or vegetables to the curry. If Palm sugar is not available, use brown sugar in it’s place. Add chicken pieces and fry until they turn slightly browned. Add bell peppers and broccoli and fry for 2 minutes. Move the chicken and vegetables on the side of the pan. Add the Panang Curry paste in the pan. Fry for 2 minutes and then mix everything up. Add palm sugar and cook for another minute. Add kaffir lime leaves, red chillies and coconut milk and let the curry simmer for 10-12 minutes. Now add water and mix well. Now add fish sauce and thai basil and mix well. Popular also as Phanaeng, Panang Curry is a Thai red curry that is easy to make and tastes as authentic as the one made in thai restaurant. Move the chicken and vegetables on the side of the pan and add the Panang curry paste in the pan. Add palm sugar and cook for another minute. Add kaffir lime leaves, red chillies and coconut milk and let the curry simmer for 10-12 minutes. Now add water and cook for another 2-3 minutes. Add salt, fish sauce and thai basil and mix well. Garnish with more thai basil and red chillies. For the Panang curry dish. I had Thai red curry paste, substuted brown sugar, no chilie peppers, but wish I had passed on the fish sauce. Hi Daniel, The ingredients of Panang Curry paste are slightly different from the Thai Red Curry Paste. That could be the reason you felt the fish sauce was not needed. When you use Panang Curry paste, it definitely uplifts the taste of the dish.